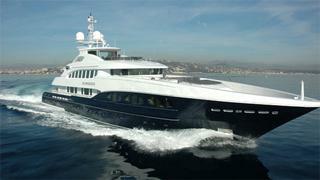 Chris Cecil-Wright at Cecil Wright & Partners tells me he's signed the 47m Heesen motor yacht Sirocco for sale. An all-aluminium tri deck yacht, Sirocco was built by the Dutch yard in 2006 to ABS class and was designed by Omega Architects. Her interior is designed around an African theme with Makassar wood, leather and natural stone elements. Sirocco sleeps 12 guests in six staterooms, a master, two VIPs a double and two twin cabins. Unusually, the master suite is on the wheelhouse deck with direct access to a massive party area and has 180-degree views through the large windows astern. Below deck there are two identical VIP staterooms with queen size beds and double baths. There is a further double stateroom and a twin cabin continues the African theme with walls lined in bamboo. All staterooms are en suite and have entertainment systems. On the sun deck, there are comfortable loungers, a gymnasium, icemaker, sunpads and a Jacuzzi. Twin 3,700hp engines give her a cruising speed of 22 knots and a range of 3,400 nautical miles at 12 knots. Lying in the South of France Sirocco is asking €21.5 million.